Do you like plants that enjoy a weekly manicure? Maybe ones that demand a leaf conditioner* once a month? Or maybe even plants that require a yearly vacation to the tropics? We didn’t think so, no one likes high maintenance…ain’t nobody got time for that**! Since we are all busy people that really just want to enjoy our time outdoors, we have come up with our top low maintenance plants. This week, in our 3 part series, we will look at our top 5 low maintenance shade plants for your Grand Rapids landscape. We’re going beyond hostas and ferns here…so buckle up! This has got to be one of our favorite perennials for a low maintenance shade garden. Astilbes are deer resistant and attractive to butterflies. 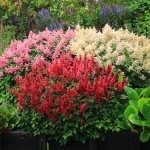 They come in red, purple, pink, white and other various shades, and typically bloom June through August. Astilbes bloom at different heights, anywhere from 8″-12″ up to 4 1/2′! They make great accent plants, but look AMAZING when planted in masses. The soft wispy blooms are sure to brighten up any low maintenance shade garden in Grand Rapids! Brunnera is prized for it’s unique silvery foliage with contrasting dark green veins, along with its wispy forget-me-not blue flowers. Blooming early in the season starting in May, and growing up to 15″-18″ tall, Brunnera can be planted as a specimen plant, along the landscape edge, or in small masses among Coral Bells, Japanese Forest Grass, or Astilbes to name a few. 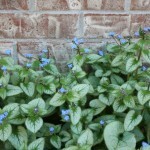 Deer tolerant and attractive to butterflies is what makes Brunnera a staple in any low maintenance shade garden. Another great perennial for any low maintenance shade garden is Ligularia dentata, which is known for it’s attention grabbing leaves. Ligularia dentata is considered a ‘big leaf Ligularia’, a bit different from other Ligularia’s in the family. It will grow between 2-3 1/2′ tall, and blooms June to August bearing bright golden yellow, daisy like flowers. 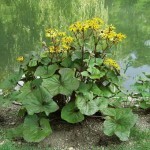 Ligularia dentata will also tolerate that wet spot in your landscape. Deer resistant and attractive to butterflies, Ligularia dentata is sure to be a welcomed addition to your low maintenance shade garden. Snakeroot or Cimicifuga ramosa, is a Native Cultivar that is deer resistant, drought tolerant, and attractive to butterflies…making it one of the most low maintenance shade plants available! 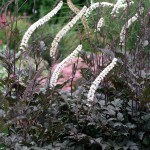 The foliage of the ‘Pink Spike’ Snakeroot perennial is a richly textured deep purple, which contrasts beautifully among bright leaved perennials such as, hostas, Japanese Forest Grass, and Astilbes. From August to October the ‘Pink Spike’ variety of Snakeroot will bear numerous pink spikes (hence the name), which also have a heavenly fragrance, and will grow 2 1/2-3′ tall. Really though Grand Rapids…you can’t get a more perfect perennial for a low maintenance shade garden! You’re still reading after telling you about Snakeroot?? Okay, fine…one more. 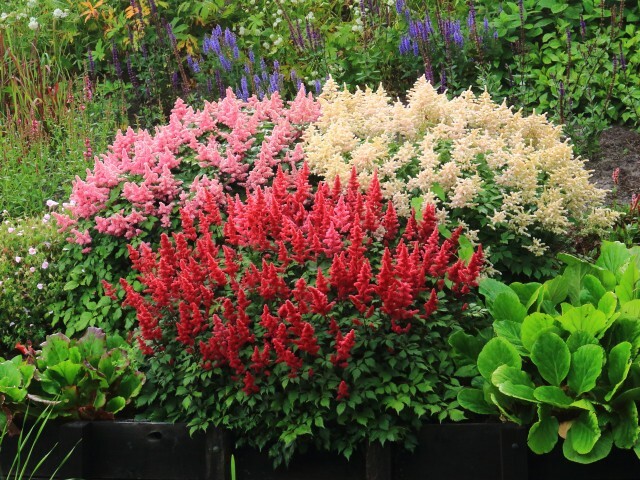 Heuchera, better known as Coral Bells, is a drought tolerant, Native Hybrid that can add that extra je ne sais quoi to any Grand Rapids low maintenance shade garden. Coral Bells may occasionally be browsed by deer, but I’ve never seen the Coral Bells at my home with any missing bits. However…do you like hummingbirds and butterflies in your garden? You don’t…? …Get out, we can’t be friends anymore. Looking for additional low maintenance shade garden ideas? Check out some of our recent projects for inspiration, or contact us to get started on your next project! 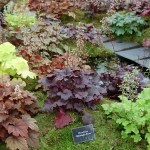 Looking for low maintenance plants for your sunny garden? Check them out here. Looking for low maintenance grasses? You can find those here. * Leaf conditioner is not a real thing…that we know of, so don’t worry.